Chen-style Taiji single sword belongs to Taiji short weapons. This swordplay consists of 49 movements with rational arrangement and cohesion. The techniques involved are mainly thrust, hack, uppercut, parry, point, slice, block, sweep, intercept, prick, push, deflect and neutralization. 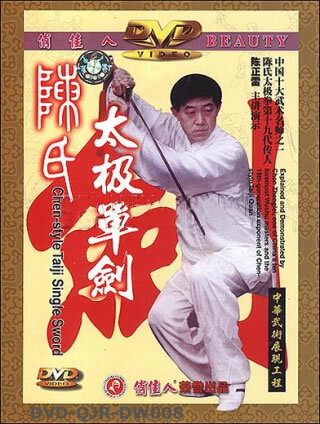 Combined with Taiji Quan's natural and poised body postion and its flexible and steady footsteps. Taiji single swordplay is full of changes. It may be played with hardness one moment and softness the next. Sometimes the sword is played so fast that it cannot be seen. The player may stick to his opponent without being separated, then jump high and dodge away. He seizes every opportunity, by feints or ambushes, to attack his opponent or tire him out. The swordplay can be characterized as continuous, sticky and changeable. Exercise requirements: You should move smoothly like flying clouds and flowing water, turn in circles and apply your force explosively like a lion shaking his hair. Be sure to keep your movements in constant changes.